The weather is getting warm, so we have been outside grilling a lot more. The farmer’s markets are also opening again, which I am so excited about. I love all the fresh fruits and veggies, like this zucchini. I also like knowing who grew the produce and that it is locally grown. This dinner was made with some of our market finds. I thinly sliced the zucchini and rubbed it with olive oil, fresh rosemary and finely chopped garlic. My husband then grilled it just until it was tender and it got nice and sweet, and a little smokey. The salad was made with lettuce and beets greens from the market. I also added a little bit of kale that I grew. Preheat the grill to about 350 or medium high heat. Cut the zucchini into long strips about 1/4 inch thick. Cover them in the oil, garlic, rosemary, salt and pepper. Toss the zucchini around until it is well coated. 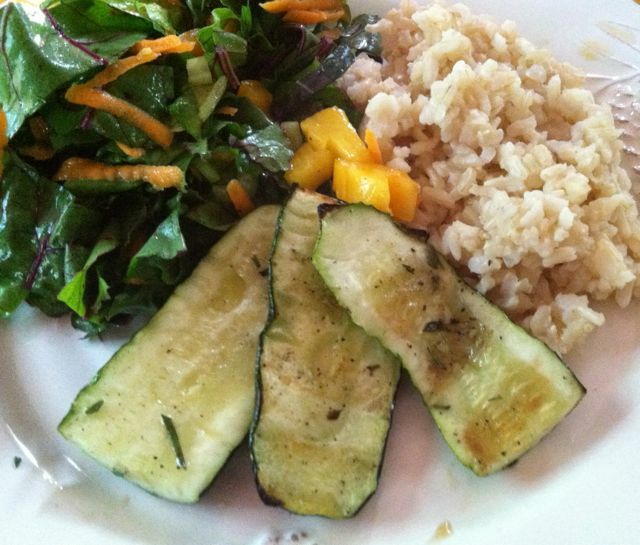 Place the zucchini on the grill and cook them for about 4-5 minutes on each side. You want it to be tender, but not mushy. Serve immediately.